Enjoy an adventure in the Pacific coast as you explore nature, snorkel in the ocean, do zip lining or go horseriding! 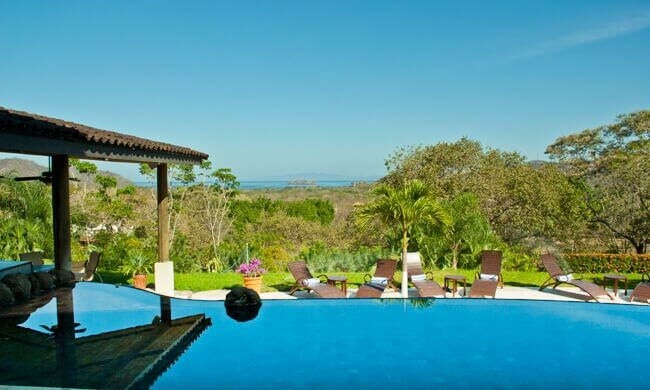 Get a FREE night during your seven-night stay in Guanacaste. As a welcome gift, get $200 bar credit during your stay. Save up to $490 for the full package. Prices include discount. Bar credit is not accounted in the price. Restrictions may apply. Stay a full week in a luxurious, boutique hotel on Costa Rica’s Gold Coast. Here you’ll enjoy adventure, relaxation and sunshine in an adult-only atmosphere only 25 minutes from the airport. Vacation starts right away! Villa Buena Onda is a large private residence-turned-hotel with spectacular views of Playas del Coco town and the ocean. With only eight rooms and usually more staff than guests, the hotel feeling is intimate and the team is always available to give you the best service. The concierge service, too, is available for any request, great or small. Ideally located in the heart of Guanacaste, this is the perfect jumping off point for exploring the many picturesque beaches in the area and getting the blood pumping with some adventure activities. With a snorkeling tour and a full combo tour included, you’ll get a great sample of the excitement that’s in store! Pop into town—just a five-minute drive or 15-minute walk—for shopping or if you’re looking for nightlife. The list of things to do is endless. With the meal-inclusive plan, you can choose from the many stand-out menu items without having to reach for your wallet. Mingle with other guests or opt for some alone time on you patio or balcony. You’ll make great use of the free $200 bar credit! Make time to take advantage of members-only access to the exclusive facilities at The Club at Coco Bay and the Beach Club at Playa Ocotal. Enjoy using the gym, pool, and tennis courts, as well as have access to snorkeling gear and yoga lessons. After you’ve squeezed out every drop of adventure possible, it’s time for some relaxation. Spoil yourselves with a 50-minute Swedish couples’ massage—your body will thank you for it. What better way to bring your tropical adventure vacation to a close! 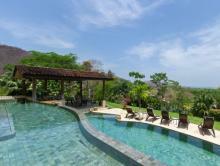 7 nights lodging at Villa Buena Onda—including 1 night FREE! 50-minute Swedish Couples Massage FREE! You’ll be staying at Villa Buena Onda throughout this package. Arrive in Liberia where you will be met at the airport and taken to your private transfer. Drive only 25 minutes to the beach town of Playas del Coco and your home away from home, Villa Buena Onda. The attentive staff and adult-only ambiance will get you immediately into vacation mode. Don’t forget your $200 bar credit! With only eight bedrooms, breathtaking ocean views and luxury amenities you can relax and have your every need catered to. Take advantage of the meal-inclusive plan by indulging in the tasty dishes created by the skilled staff. Kick start the adventure with a full day of exploring the local beaches on a Snorkel and Surf tour. 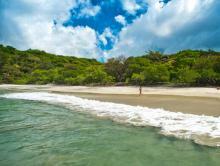 Visit some of the most unique spots in Guanacaste and see why this is called the Costa Rican Gold Coast. Get in the water at select beaches for excellent surfing and snorkeling that make them famous! Take the complimentary transportation from the Villa down to The Club at Coco Bay—free during your stay at Villa Buena Onda—and enjoy member only access to the tropical pool, tennis courts, yoga pavilion and full service restaurant. Further down the road and steps from the tranquil, black sand beach of Ocotal you’ll find the Beach Club. Here you can relax in the infinity pool or lounge in the beach chairs provided, even use the snorkeling gear to explore the water! Villa Buena Onda will pack your lunch for you if you want to spend all day at these exclusive facilities. Enjoy a real adventure day at Guachipelin where you can try almost everything. From zip lining and Tarzan swings to horseback riding and a climbing wall, this day packs it all in! After all that adrenaline, finish up the day at the thermal pools where you can relax in the soothing waters and paint on the therapeutic mud. Stay close to the hotel today. You can take advantage of the free hotel shuttle to three local beaches and do some souvenir shopping in the funky shops of Playas del Coco. In the afternoon head back to the Villa to watch the sun go down as you sip on a delicious cocktail poolside. Enjoy your last day to do whatever you like: return to a favorite spot, just chill at the Villa and enjoy some R&R, or set up another tour that has been calling your attention. Options include kayaking, scuba diving and ATV tours, to name a few. Take the short 25-minute private ride back to the Liberia Airport for your flight back home. Get an incredible adrenaline rush on this very unique visit to Rincón de la Vieja National Park. 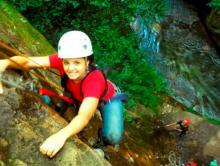 Canopy tour, rappelling, horseback riding, and more! 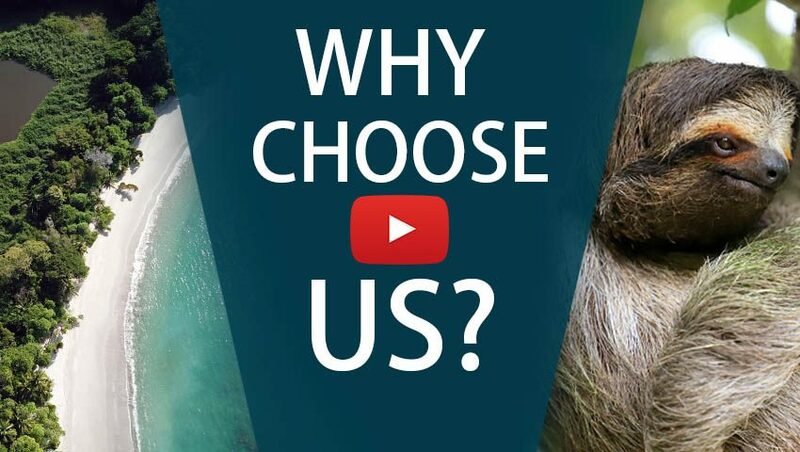 Experience four very distinct beaches all within a few miles of each other.